Hankins The Oil Pollution Act of 1990 Beaver In the United States virtually all marine casualty was in a critical state. (OPA90) de? nes how all stakeholders maritime casualties of any consequence Today, salvors are recognized as lead- insights from a trio will respond to potential or actual oil inevitably becomes of interest to the ing the effort to prevent oil from enter- of maritime salvage spill responses. Where salvors are the U.S. Coast Guard. One of the several ing the water – keeping it inside the ship tip of the spear to keep that oil in the key functions of the Coast Guard is the or safely lightering the oil and fuel to leaders – Paul Han- ship, the OSROs try to collect the oil protection of the marine environment a receiving vessel – and achieving the once that oil has spilled. The response from oil pollution. This function natu- national goals of safety, environmental kins, Tim Beaver & organizations are indeed intertwined, rally comes to the fore during a mari- protection and keeping waterways open. This function therefore becomes the salvor to mitigate or eliminate the pol- the people with whom you might be driving force behind a very active coast lution release related to a speci? c ca- the most challenging working one day. Elliott While salvors and oil spill re- perative that the OSRO’s be noti? ed if of the scope of work of the salvor. A sponders have traditionally worked to- sectors of the mari- not activated, and an incident command competent salvor is not only expert at all gether during marine casualty response system stood up. This is simply a fact the various aspects of maritime salvage time market. Response Plan is activated, to conduct ing service providers are now working salvage industry. 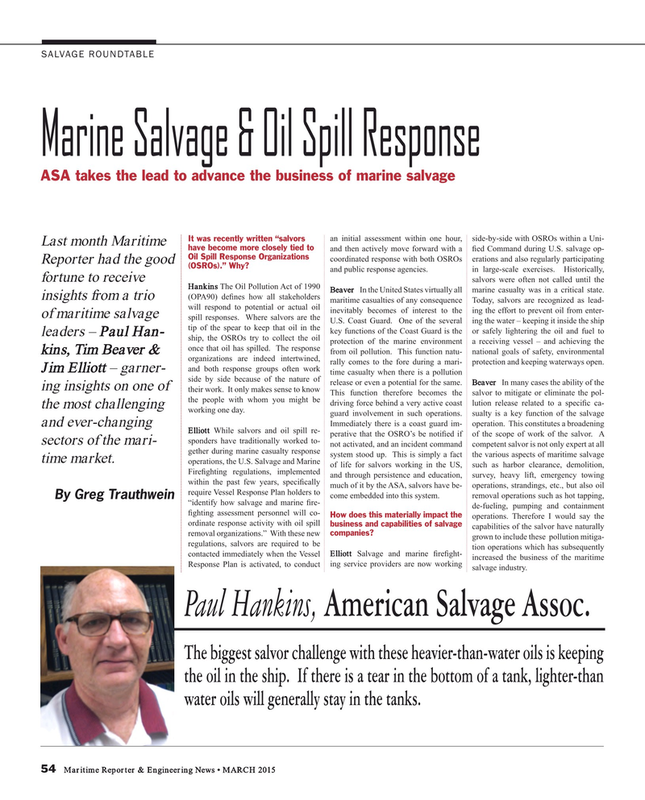 Paul Hankins, American Salvage Assoc.